Rhoscolyn VillageRhoscolyn is a village located on Holy Island, Anglesey. It is just over five miles south of Holyhead and is the most southerly settlement on the island. The name Rhoscolyn is said to mean "The Moor" (Rhos) of The Column (colyn). A little to the west of the village is a mediaeval well dedicated to St Gwenfaen; the local church in the village itself is dedicated to the same saint and was first built in the 6th century. Rhoscolyn is a village located on Holy Island, Anglesey. 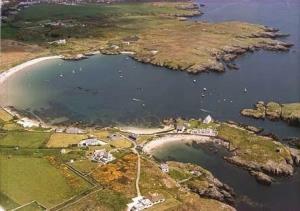 It is just over five miles south of Holyhead and is the most southerly settlement on the island. The name Rhoscolyn is said to mean "The Moor" (Rhos) of The Column (colyn). Just south-east of Rhoscolyn is Borth Wen, a sweeping cove of sand backed by dunes with rock pools on the beach. A55 Junction 3; A5 to Valley and left onto the B4545 signed for Trearddur Bay. Over Four Mile Bridge and left where signed to Rhoscolyn.